After you’ve learned how to sketch out a handful of basic icons, how do you go about expanding your visual language from there? I have three specific tips for you, three ways that you can go about expanding your own visual language. The first thing to try out is simply merging two icons. Start experimenting with what it might look like to smash together two icons that initially are totally unrelated. Try merging two unrelated icons to see what new visual metaphor you can create. If you start with a simple line drawing of a flower and think about how you might merge that with a gear icon, you might get something like what you see above. The gear replaces the flower and then instead of the leaves below it maybe you replace those with screws. That gives you an object that merges the mechanical with the organic, which maybe could represent machine learning, artificial intelligence, or biomimicry. So essentially what you’re doing here is creating new visual metaphors by smashing together two simple icons. 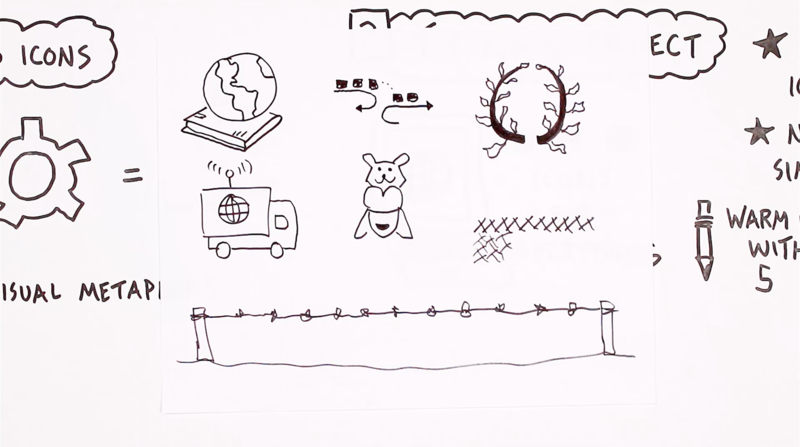 The two that I chose came from the Visual Vocabulary Pack that’s included with my intro course, An Introduction To Visual Note-Taking, so feel free to dig into that if you want to check out some other icons. The general idea of merging two icons was the premise of a video that I created a few years back with my friend Austin, Sketchnote Story Cubes Mashup, in which we used Story Cubes as the source of the two icons, and we had to come up with our own ideas of what the combination of those might look like. What I find interesting about this first method is that you can get to surprisingly complex and nuanced ideas by merging together just two fairly simple icons. So I think that can be a great way to start expanding your visual language as you develop your own visual metaphors that you might be able to use within your notes. My second tip also has icons at its core, this time from a website that I highly recommend you check out called The Noun Project, a website for designers who are in search of icons to use in their creative project. Their tagline is “Icons for Everything” and the archive is huge. One of the things that I like about that website is that they have new featured icons each day. That makes for great source material if you’re looking for some daily warm-ups or skill-building activities. Check out The Noun Project for icons that range from the simple to the complex. What I appreciate about the icons that you’ll find there is that there’s a nice variation from simple to complex. A lot of the icons are very straightforward and easy to draw, but then there are some that are fairly nuanced that will help you to stretch your drawing skills to the point where you can accurately represent more complicated objects. One activity that I encourage you to try out using The Noun Project is to start by warming up by drawing the five latest icons that you see featured there. Then, from those five that you just drew, pick the two that you feel like might be the most useful for your note-taking purposes and try altering them in some way. That ability to slightly alter the visual representation of a particular object can be really helpful when you’re capturing ideas at a conference, in a meeting, or from a podcast that you’re listening to, because small alterations can help you to tailor that image more directly to the ideas being shared. A warmup activity of sketching out the five new featured icons on the site one day. 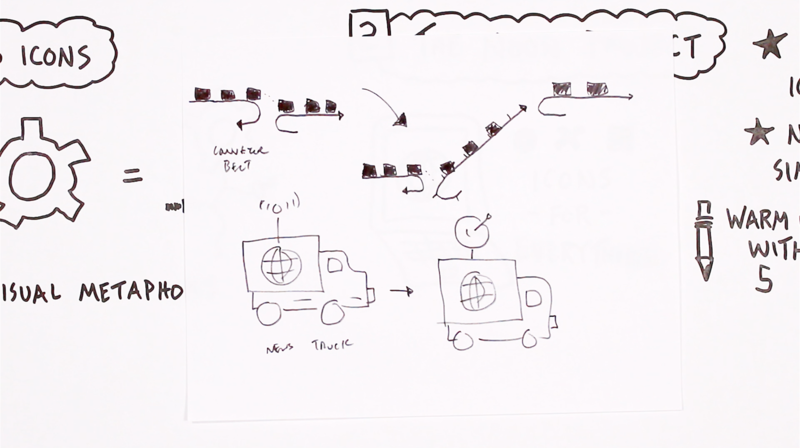 Above are five different icons that I sketched out one morning, and below I decided to focus in on two to try altering: a conveyor belt and a news van. My alterations to the conveyor belt and news van icons. With my alterations, you can see that I tried to add a little bit of complexity to the conveyor belt by adding one more chain to that system, because I feel like the general concept of a conveyor belt is the type of system that might make for a useful analogy. With the news van the alteration was quite a bit simpler. I just swapped out the small antenna that felt more fit for a car and replaced it with a bigger satellite receiver. Whether or not you actually use these icons or your alterations in the future isn’t important. 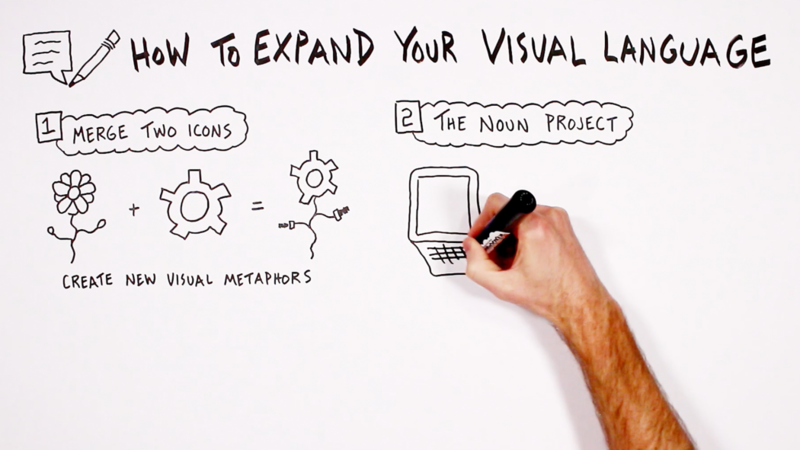 Because what you’re developing here is the core skill of manipulating the visual representation of objects, and it’s that skill that’s going to come in handy the next time you’re trying to come up with a specific visual to connect to the idea, the process, or the story that you’re taking in. Speaking of stories, I think that’s where this third and final approach might come in handy, which is to start creating scenes. I like to think of scenes as something you might see out the window or what you might capture in a photograph, but with much lower resolution and sticking to the use of multiple simple images to depict a situation. Here’s an example of a scene that I sketched out when taking notes on a podcast conversation between Debbie Millman and Ingrid Fetell Lee on Millman’s podcast Design Matters. Create custom scenes by weaving just a few visuals together. Notice the simple scene on the left page as well! 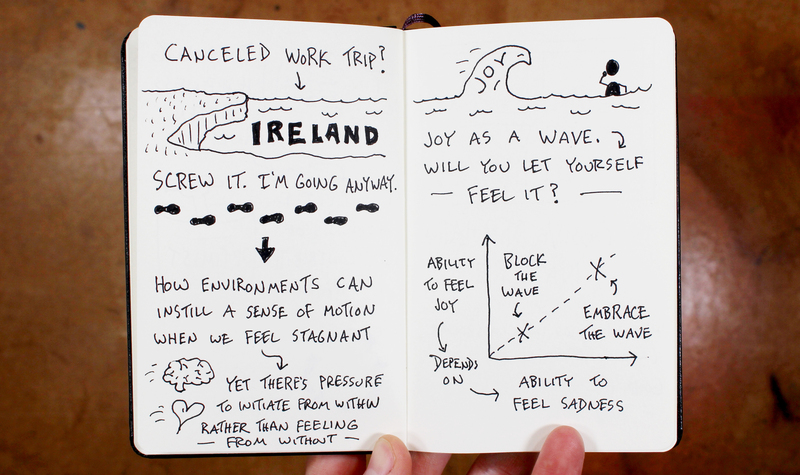 You can view the full set of sketchnotes from that conversation here: Sketchnotes on Joy vs Happiness. In this case, joy was described as a wave coming at you that you can either choose to embrace or throw up your arms and try to block, and the little scene that I’ve sketched out is really just the combination of a few different simply-drawn elements. First you’ve got the water, then there’s a singular wave drawn big enough to be able to write the word joy inside of it, and then there’s a simply-drawn stick figure. I hope that what this shows is that scenes don’t have to be super complex or artistic. It’s really just about finding a few visuals to capture the setting and a couple of important objects or characters that are the important role-players in whatever situation you’re depicting. And much like the merging of two icons or the alteration of an icon, the creation of scenes is something that you can get better at with practice. So that’s what I encourage you to do now. 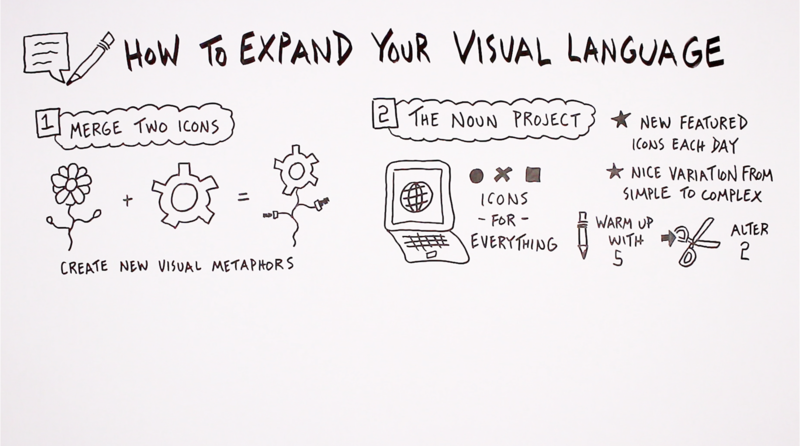 Pick at least one of these approaches to expanding your own visual language, and give it a try. Because I think that it’s these types of alterations, these types of creations, that really allow for you to personalize the notes that you’re taking. They allow you to create something that you’ve never created before, and maybe something that no one has ever created before. It’s those types of visuals that can really stick in your brain and give you a solid connection to the ideas that those visuals represent. So I hope you enjoy trying out these activities for yourself. 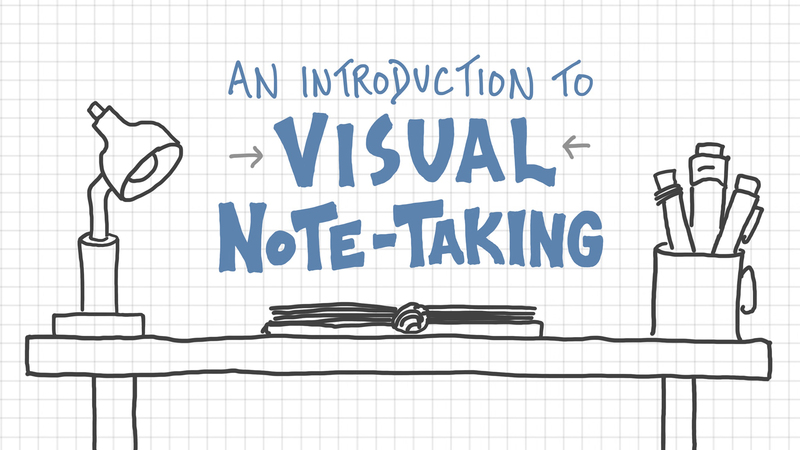 More tools to help you build your visual note-taking skills in our intro course. You can view our full course library here. 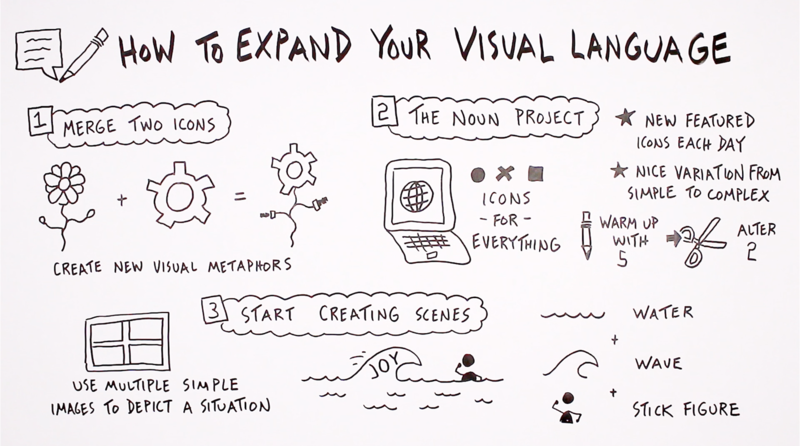 Good luck expanding your own visual language to better suit your needs and your goals with visual note-taking!